Last Friday, the Bureau of Labor and Statistics (BLS) reported that the unemployment rate for Post-9/11 veterans increased from 5.4 percent in June 2015 to 6.7 percent in July 2015. 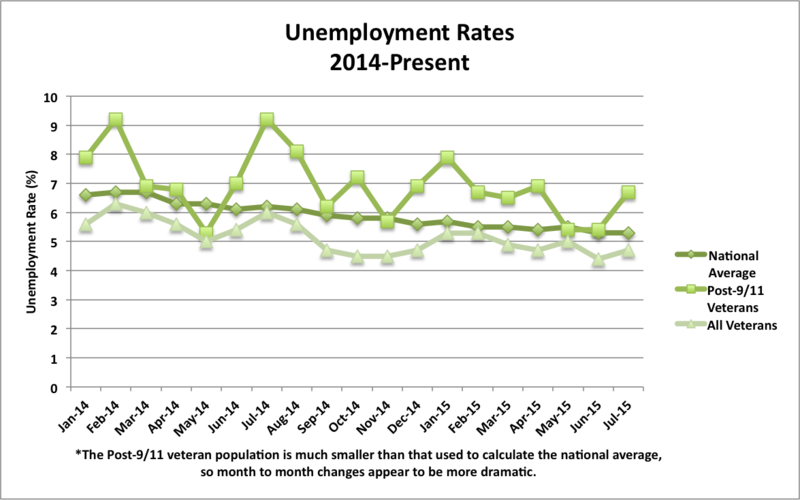 Among all veterans, unemployment rates increased from 4.4 percent in June to 4.7 percent in July. 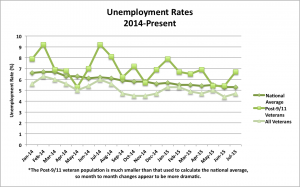 The national employment rate remained unchanged at 5.3 percent in July 2015. Earlier last week, U.S. Senators Joni Ernst, Kirsten Gillibrand, Mark Kirk and Joe Manchin introduced the new Senate Post-9/11 Veterans Caucus, which will focus on improving the post-military lives of those who have served since 9/11. In their first event, these Senators stood together with industry leaders from Starbucks and Uber to highlight the employment challenges facing the newest generation of veterans. While employment trends have been improving over the past few years, the unemployment rate among younger veterans still remains higher than that of older generations and Post-9/11 veterans still see higher unemployment rates than veterans from previous conflicts. In the figure below, you can see unemployment trends for post-9/11 veterans from 2014 to present, compared to those for all veterans and the national average. In the first Post-9/11 Veterans Caucus event, speakers highlighted the promising results of initial efforts by these companies to recruit more veterans in recent years. In November 2013, Starbucks committed to hiring 10,000 service members or their spouses and has brought on 4,600 veterans to date. As a result of the UberMILITARY program, over 20,000 members of the military community have collectively earned over $63 million by working for Uber. However, many veterans still face challenges in gaining employment. Speakers highlighted the fact that mental and physical health challenges serve as a barrier to employment for many returning veterans. In IAVA’s 2014 Member Survey, 53 percent of our veteran respondents reported that they had mental health injuries and 60 percent indicated they had been wounded in service. Among those who were unemployed but not looking for work, about one-third stated that this was because of concern about their mental health challenges. With Post-9/11 Veterans Caucuses now present in both the House and Senate, congressional leaders will be able to bring many of the challenges facing the newest generation of veterans to the forefront and work together to address them. In addition to their work on this caucus, Senators Manchin and Kirk are also Co-Chairs of the Congressional Veterans Job Caucus, which is focused on creating solutions for the challenges that Active Duty, Reserve and Guard members face as they transition to civilian life. IAVA is excited to see the initiatives put forward by these caucuses in the future, and hopes that they will remain active in their efforts to improve the lives of our service members, veterans, and their families. As more new veterans return from service, we must remain focused on improving the transition process, so that veterans can successfully move from service to civilian life. An integral part of this process for new veterans is gaining access to employment that will make use of their skills and abilities and allow for personal and professional growth. 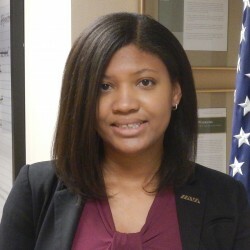 For specific policy recommendations aimed at supporting veterans in the workforce, see IAVA’s 2014 Policy Agenda.